University Village has two, 800-stall parking garages which are accessible from the 25th Avenue NE entrances. 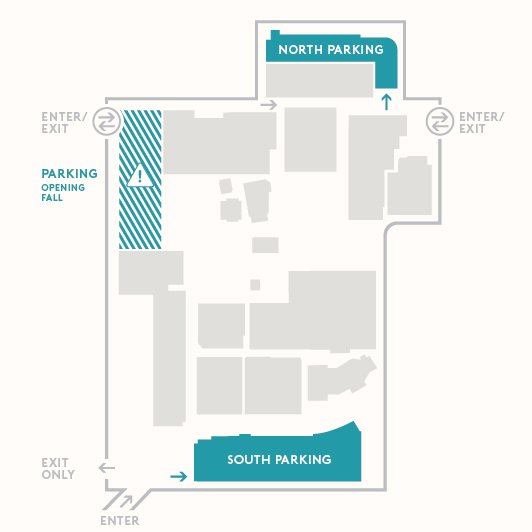 One garage is located to the North, behind Crate and Barrel and the second is located to the South, next to JOEY Kitchen. Seattle Department of Transportation (SDOT) is repaving 25th Ave NE. Please follow SDOT detour routes or choose alternate access to U Village via NE 45th St. or Blakeley St.
Take the Montlake exit and follow Montlake Boulevard going north past Husky Stadium. Then veer left onto 25th Avenue NE and University Village will be on the right. Take the NE 45th Street exit and head east. Continue along 45th past the University of Washington. At the bottom of the hill take the first right and loop around to 25th Avenue NE. University Village will be on the right.